We are doing it again! After our amazing week in Tulum last year, we are excited to announce our second annual intensive in Mexico! Come for a week of skill building in acro, inversions, creative flows, and more. Same teachers, different location! We have found a new exciting location. We will be hosting our intensive in the quaint city of San Pancho Mexico at the Circo De Los Ninos. It is a non-profit circus school put together by the co-founder of Cirque Du Soleil and Creative Director, Gilles Ste-Croix and his wife Monique Voyer. They have created this space for locals to have an opportunity to experience human empowerment through the circus. Their mission is to “Encourage the holistic development of youth and young adults by improving their artistic, creative, motor and communication skills, as well as strengthening their confidence in taking risks in a secure and safe environment”. We have the privilege to share this space for a full week of training in this curated space. With the access to gymnastics mats we will incorporate more tumbling into the curriculum, as well as a dance studio to help develop your acro grace. Whips, Pops, H2H, Dance Lifts, and some Standing Acro will be included. Prepare to dive deep into all new creative flows and washing machines. We will spend time on proper alignment, helping you with your fancy footwork, and strengthening your transitions. Everyday we will be exploring various inversions. Anticipate learning skills such as how to press to handstand, proper inversion alignment, and personalized tips and tricks to help develop your physical practice. Included will be progressions for beginner inverters. You can also expect some thai massage, strengthening activities, and various stretching exercises throughout the week. We are starting on the morning of the 10th at 9am, please make sure to arrive the day before to get settled and ready to start the next morning. Afternoons are off so you can enjoy the beautiful city, water, surrounding areas and tours. A seven day full spectrum Acro and movement training. This year we are trying something different since everyone has many different specificities. You can find Airbnb as cheap as $15 USD a night to whatever your budget may include. There’s loads of delicious restaurants to eat from in the area including vegetarian. If you are on a budget, the local grocery area has beyond affordable foods which you can prepare at home. We both love visiting San Pancho for a few reasons. For one, the night life is phenomenal. They close off the main road (which is the major thoroughfare through the town) for live music and performances. Secondly, they have a large beautiful beach to hang out during your down time. And lastly, the city has a great vibe, is super easy to get around by foot, and you will have lots of time to explore the area during the breaks. *There are no refunds. However, you can find someone to take your spot with our approval, and or use it towards another event we will be hosting. – handstand against the wall for 30 secs. -Having done Acro for more than 6 months and feeling stable in your practice. This training is really about diving deeper into your practice and taking it to the next level. For Ladybase, movement is an essential part of life. She spends countless hours on her yoga mat, playing and exploring with the circus arts and Acro. She is happiest in her creative mode! Her passion has spread internationally teaching in numerous countries. Melanie is certified in Vinyasa Yoga, as well as Level 1 AcroVinyasa, Yin Training, Lead with Love Yoga mentorship, and has taken the Born to Teach Bossy Pedagogy Course. Melanie also has a background in Transpersonal Counselling-Psych, and she feels immensely passionate about merging this training with her love of movement. 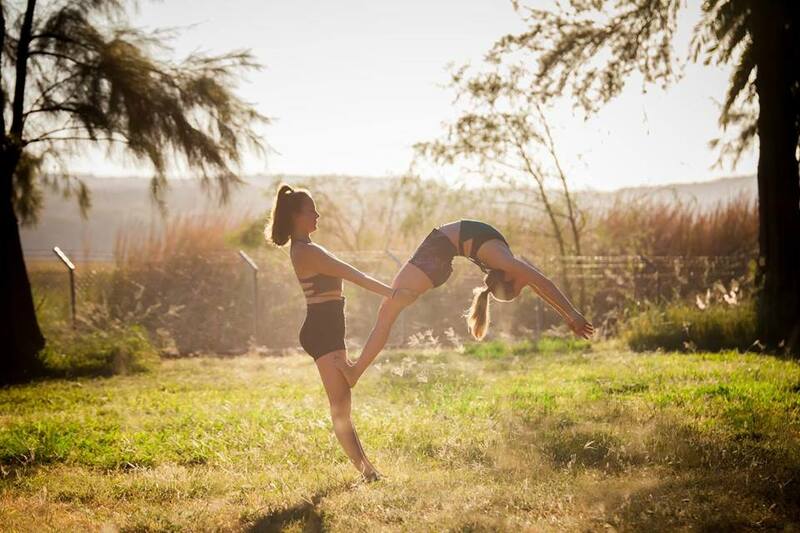 Part of what fascinates Ladybase about Acro is the healing that can happen when humans train and play together. Melanie believes Acro is a platform that gives people a wonderful way to practise trust, communication, and build community. Her zeal for Acro lies in teaching intricate washing machines and “out of the box” explorations. Ever since April can remember she was involved in human movement. She began gymnastics at the age of 5 and continuted training, competing, and coaching for 13 years. She has done everything from pole-vaulting in university, to capoeira and ultimate frisbee. She completed a degree in Kinesiology at the University of Saskatchewan BSC in sports and exercise and did personal training for 4 years. April began to find her passion in the spirituality of yoga and completed her yoga teacher training in mysore style ashtanga, as well as the AcroYoga Montreal teacher training. She has taught yoga and acroyoga internationally and loves to assist people on their journey passing along the techniques she has acquired along the way. Want to get stronger? Fine tune your Acro skills? Improve your handstand? Enjoy some beautiful beaches? JOIN US for a week in Mexico! Join this dynamic duo in Tulum, Mexico for a week of skill building in Acroyoga, Yoga, Inversions, and Creative Flows. Not only will you be expanding your acrobatic skills, but also included in the package will be a trip to The Grand Cenote Cavern, and The Temazcal which is a ceremonial sweat lodge for spiritual growth and health. Dive deep into all new creative flows and washing machine. We will spend time refining proper alignment, fancy footwork, strengthening transitions, and learning how to flow gracefully. Exciting moves such as Whips, Pops, H2h, Dance Lifts, and some Standing Acro will be included. Begin your day with yoga in the beautiful Shala and breath and relax amongst the lush background. While we lead you through the Asanas and take time to break down postures, you will be receiving hands on assistance. Everyday we will exploring being upside down and honing in on various inversions from yoga to gymnastics techinques. Anticipate learning skills such as how to press to handstand, transition from pose to pose, proper inversion alignment, and receive personalized tips and tricks to help develop your practice. We will also be giving progressions for beginners. Come explore out of the box movements and unique transitions, that will hopefully inspire your creative juices to flourish. 2 nutritious and delicious vegan and vegetarian meals per day. WANT TO JOIN, what’s the cost?! SUPER EARLY BIRD – 5 SPOTS ONLY: $999 USD , sould out! -> 50% Refunded if cancelled before Sept 1, 2018. Remaining amount due on Sept. 22nd, 2018. For Ladybase, movement is an essential part of life. She spends countless hours on her yoga mat, playing and exploring with the circus arts and Acroyoga. She is happiest in her creative mode! Her passion has spread internationally teaching in numerous countries. Melanie is certified in Vinyasa Yoga, as well as Level 1 AcroVinyasa, Yin Training, Lead with Love Yoga mentorship, and has taken the Born to Teach Bossy Pedagogy Course. Melanie also has a background in Transpersonal Counselling-Psych, and she feels immensely passionate about merging this training with her love of movement. 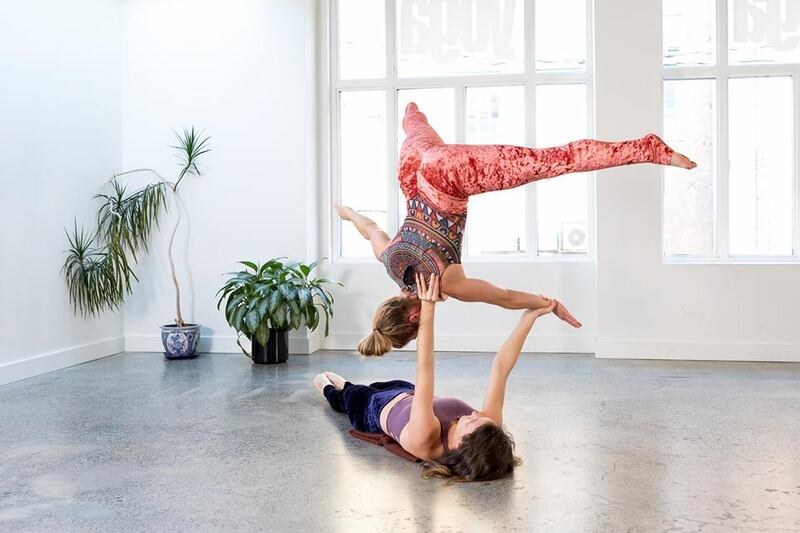 Part of what fascinates Ladybase about AcroYoga is the healing that can happen when humans train and play together. Melanie believes Acro is a platform that gives people a wonderful way to practise trust, communication, and build community. Her zeal for Acro lies in teaching intricate washing machines and “out of the box” explorations. Channel your inner ninja and grace in this dynamic weekend of Acro that requires fancy footwork, smooth buttery connection, and precise balance and movement from both base and flyer. We will focus on hands-free transitions, creative Ladybase Washing Machines, H2H preps, inversions, and more! Don’t miss this weekend! ..underground, follow the ramp from the parking lot, budo 2: after the main corridor turn left..
As a child growing up in a small town, Melanie had always craved for dance and circus arts. With a constant desire to move her body, she used dance and play to express herself throughout the years. She later moved to Vancouver where she fell in love with Yoga, leading her to her true love, Acroyoga. While practicing Acro she experienced the power it can have; how it can break down walls, foster expression and create communities. Guided by good friends and inspired by great teachers, Melanie would later become a moving force in the AcroYoga world. Eventually, her passion turned into a profession as she traveled internationally. Learning, practicing and teaching Acroyoga became her essence of living. Ladybase believes Acro discovered the talent in her. Melanie is renowned for her engaging and creative training techniques. Her knowledge and appreciation of Biomechanics, and background in Transpersonal Counselling-Psych adds to her teaching ability. Her communication skills, gentle nature and charisma make her teaching very special.